Ever since Steve Ballmer announced that he will retire from Microsoft after serving the company for 33 long years, there has been intense speculation over the next CEO of the company. And now, rumors are ripe that the choice has narrowed down to three persons, one among them is an Indian named Satya Nadella. Satya Nadella is currently serving Microsoft as Executive Vice President of Cloud and Enterprise Group. 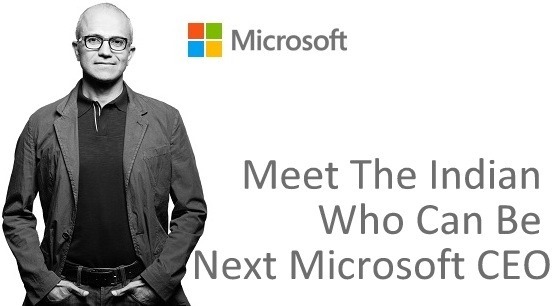 He is responsible for building and running Microsoft’s Cloud Platform, its developer’s tools and cloud based services. Previously, he managed the Server and Tools Business with a turnover of $19 billion, and led the transformation from client-server model to Cloud Technology. He also served as Senior Vice President of Research and Development at Microsoft’s Online Services division, more popularly known as the person responsible for search and advertisement technology. Before joining Microsoft in 1992, he worked with Sun Microsystems. His educational qualifications are impressive as well: He completed Masters of Science in Computer Science at University of Wisconsin–Milwaukee; MBA from University of Chicago and BTech from Manipal University, which was formerly affiliated with Mangalore University. He is originally from Hyderabad, where he completed his schooling at Hyderabad Public School, Begumpet. Who Else Are In The Race? Along with Satya Nadella, two other persons are termed as favorites: Ford CEO Alan Mulally and Tony Bates, former head of Skype. Among them, Tony is the choice of Silicon Valley, as he has several good previous experiences, including serving Cisco where he single handedly managed a global workforce of 12,000 and generated revenues of $20 billion for the company. He came into Microsoft as a result of Skype acquisition and remained with the company ever since. He has helped Skype reach 170 million users every month, out of which around 8% are paid customers. And the biggest advantage he has over other contenders: He is a self taught programmer. Alan Mulally, who is currently serving as Ford Motor’s CEO is an engineer, who was previously working with Boeing. He has the experience and expertise of managing a top level global organization and some skeptics are claiming that he is one of the strongest contenders for CEO’s title in Microsoft. As per the internal talent search documents of Microsoft, they are looking for a person who has “extensive track record in managing complex, global organizations within a fast-paced and highly competitive market sector; track record of delivering top and bottom line results. Proven ability to lead a multi-billion dollar organization and large employee base.” And as per this description, Alan fits the map. But, some experts are also claiming that Alan would be a terrible choice. Microsoft board and share holders will decide their next CEO by end of 2013, and the competition is still very hard. In case Satya Nadella is eventually selected, then it would be a huge moment for all Indians. It’d be very proud moment for every Indian and inspiration too! I fail to understand why should Indians be proud ?